In February of 1991, Senior Associate Leigh Noda was working for ARCO as the manager of business and technology in ARCO’s flagship refinery in Carson, California. One afternoon, the refinery’s manager called Leigh into his office with a very special project. Ronald Reagan was turning 80 years old, and the Ronald Reagan Presidential Library in Simi Valley was having its grand opening. Lodwrick Cook, ARCO’s chairman at the time, was friends with Margaret Thatcher, who was scheduled to attend the event. Thatcher had just resigned after 11 years as Britain’s prime minister, and had only been to California once in 1969. Because of this friendship, ARCO underwrote her entire visit, and of all the options offered to Thatcher, she asked that a tour of the refinery be at the top of the list. Weeks of preparation were needed to ensure the three-hour event ran perfectly, and Leigh was tasked with organizing, planning and executing the entire project. The most difficult aspects of the operation for Leigh were deciding what to highlight on the tour, and making sure appropriate resources were available to ensure the visit went off without a hitch. The 400 MW cogeneration power plant in the refinery was put on the list of things to see in addition to a presentation from the team who had recently been applauded for making EC-1 Regular, the first reformulated gasoline, and taking it to market. 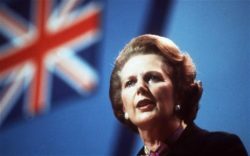 Thatcher was asked to speak as well, and the space that Leigh’s team had to transform for the event went from a large, enclosed empty area to an auditorium with carpet, curtains and room enough for 150 from the refinery to sit comfortably. No detail was too small. Leigh learned this first-hand when he and his team were informed that Sir Denis was a smoker. Smoking was, of course, not permitted on the site, so a special, temporary smoking enclosure was created at one of the stops. To avoid an awkward scenario of providing such a space only for Sir Denis to smoke alone, one of the refinery’s British employees was tasked with smoking in the enclosure so Thatcher’s husband wouldn’t be the only one in there. Fortunately, the tour was a complete success, and Leigh remembers Thatcher being friendly and very smart. It was a fascinating experience for him, and of all the projects he was asked to execute when he worked for ARCO, this one certainly was one that was “out of the box”. He never raised his hand to plan elaborate refinery tours again, but is happy to have had the experience of planning and successfully executing “Operation Iron Lady”. Leigh’s story is just one example of the finely-honed skills the Stillwater team possesses which enable us to conquer unusual, complicated projects. Do you have an “outside the box” question or project? Contact us!